You can never be too rich or too thick. 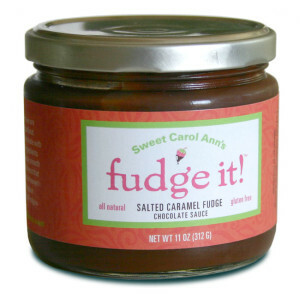 Our Fudge It!® sauces are all natural and gluten free. 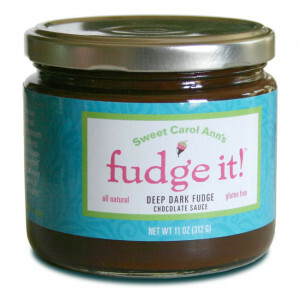 Made with the finest ingredients— like real cocoa, cream and sweet butter, we create our deliciously decadent rich and thick fudge sauces to be drizzled on ice cream, dipped with fruit or piled high on cakes or brownies. At Sweet Carol Ann’s, we believe you should always get your just desserts! Sorry but our sauces are not available at this time. Sinfully rich and thick, a chocolate lover’s true nirvana. Pour over ice cream, dip your favorite fruit or just dig in with a spoon. INGREDIENTS: SUGAR, CREAM, UNSALTED BUTTER, NATURAL COCOA, VANILLA EXTRACT, SALT. CONTAINS MILK. Sweet buttery sumptuous caramel fudge enriched with a pinch of sea salt. It is all you love about caramel and fudge combined together to give your taste buds an explosion of smooth, buttery, sweet, salty, and intense chocolate in one decadent bite. Add it to your favorite cheesecake or pile high on ice cream for a truly sophisticated dessert. INGREDIENTS: SUGAR, CREAM, UNSALTED BUTTER, NATURAL COCOA, CARAMELIZED SUGAR, VANILLA EXTRACT, SEA SALT. CONTAINS MILK. 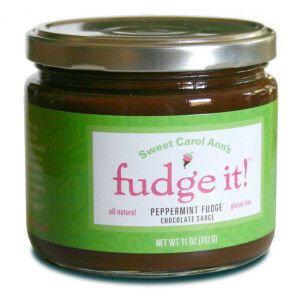 A refreshing blast of peppermint combined with a velvety dark fudge sauce. It is almost like biting into a deep dark chocolate peppermint patty. Perfect over brownies, ice cream or swirled into a steaming mug of hot chocolate. INGREDIENTS: SUGAR, CREAM, UNSALTED BUTTER, NATURAL COCOA, VANILLA EXTRACT, NATURAL PEPPERMINT FLAVOR, SALT. CONTAINS MILK.